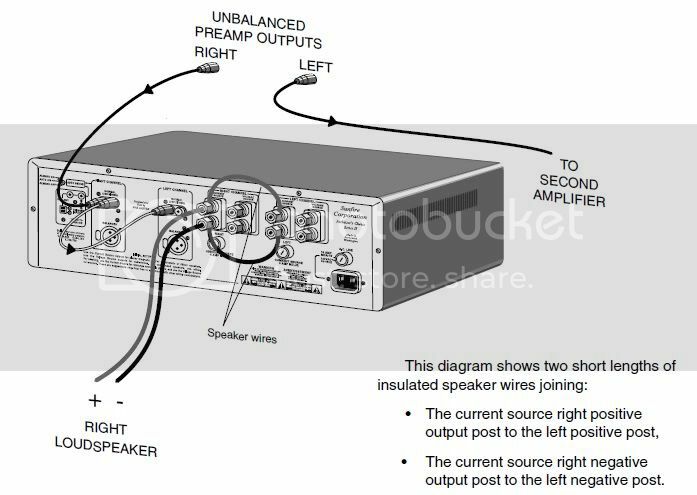 Can the original Sunfire amplifier (300 wpc) be bridged? If so, how do you bridge, is there a switch? There appears to be at least 3 different models of the Sunfires and doing searches just increases the confusion. Can not find a manual for the originals only the series II and the 300~2. Yes it can, it tells you how in the manual. I can't remember exactly how at this moment but I think you use the current source outputs. elshout wrote: Can the original Sunfire amplifier (300 wpc) be bridged? If so, how do you bridge, is there a switch? There appears to be at least 3 different models of the Sunfires and doing searches just increases the confusion. Can not find a manual for the originals only the series II and the 300~2. Yes- but you need 2 of them as you make it a mono amp- hope this helps! Thanks Chauss. Any idea what the mono power would be into 8 ohms. Does it triple like most bridged amps? Also, is it only the original Sunfires that can be bridged, or can the Signature Series II also be bridged? I do not know why you would need to bridge the Signature series....but I think they work the exact same way. I believe it will effectively double the power. 300 x 2 will become a 600W mono amp. The Signature is already 600W....WHY would you need 1200W? You would need separate circuits to power each amp! THAT is a lot of power!!! If you have the 300 x 2 Signatures- I think they are 325W...so they would effectively become 650W mono amps. The illustrations from the manual demonstrate a *parallel* bridged configuration. AKA "strapped" - note the jumpers connecting the output terminals. A parallel bridged setup *will not* gain you any more power into a given resistive load! The only way for more current to flow would be to increase the voltage to the load. Plug a lamp into a 120V outlet, it doesn't care if the circuit supplying the outlet is capable of 5 amps or 5000, it'll have the same brightness and power either way. Where parallel bridging helps is with *reactive* loads (most speakers) or loads that dip so low that they draw instantaneous current that an amp couldn't otherwise supply. By being able to deliver twice as much current as a single channel, the amp can now deliver the power the load is drawing. Note that the Sunfire manual specifies the use of the *current* source terminals, which have internal 1R resistors in series with the voltage terminals. The resistance prevents one channel from driving the other, and acts like ballast to make sure each channel contributes evenly. But unless you're doing something unusual (current source driving of woofers), I don't see the advantage parallel bridging the current source outputs would have over a single voltage output. Maybe let each channel work easier for longevity and less distortion, but the downtracking probably minimizes heat and distortion in the output stage with load invariance anyhow. Contrast to the "usual" *series* bridging which doubles the voltage output. Hence four times the power into the same load. But since most amps aren't load invariant, they can't deliver(at highest power) the double the current required, thus series bridged max power ratings run around only 3x the single channel power. If I set the brilliance control to max on my sound lab's, they can present a almost dead short to the amps. They are the grim reaper of speakers...happy to say my Bridged Sunfire 300's can handle the wild impedance swings they put out without any trouble at all... Bob made on Hell of an amp and I'd put 'em up against anything out there today. I had to bridge two of my Stereo Signatures to run some idiotically inefficient (but very good sounding and only moderately insensitive) 15" subs. I was not happy. And yes, I run them on separate dedicated 20 amp breakers. It all worked out as a net positive, but I had to do some judicious experimenting with the fuses to get what I needed out of them. It's okay now, but for a time it was a major PITA. I am sure I'm wrong but it just seems to me that if a speaker is so ineffecient to need that high of power, then A very large amount is instead going to heat. Wouldn't it be at least a bit like an electric heater? How do the elements deal with the heating? I've never been around a speaker able to handle that kind of wattage. Wow. Well, "Yes and No". This SW is a derivative of very high-end SW designs that began in the Automotive World (really, in my opinion, they actually started with Bob's SW design) and jumped back to Domestic Design. Its very stiff spider/suspension and magnet structure make it VERY accurate and it plays REALLY loudly REALLY LOW. (The -3dB in my room is in the region of 8-12Hz-there are four of them ran in front and rear Stereo pairs.) But yes, I've talked to the Owner (I was he and his Dad's Trumpet Private Instructor for many years) and as the heat factor goes up, so does the resistance. So it does have an issue with some small amount of Electrical Compression. The bigger problem was the variations of specifications on the back screen printing on the variations of Stereo Signatures exclusive of the 625wpc/8ohms variation. Some said 10 amp, some say 15 MDA and the individual current tap fuses varied from 5 amp to 7 amp. I've received amps (some of them restored by "the guy") with 8 amp fuses in one channel or another. So, I had to experiment (with my hands STAYING on that bottom plate, to check for heat) to find out which would let the amp "do its thing" to maximum benefit without putting their corporeal integrity at risk. As "the guy" told me in a phone conversation when I called him about it: "If it's too hot to touch it's too hot to fuse". And I think that's spot on. The good news is the amp's hold up. Unlike what's said by people who've never owned a Carver product (I've owned more than I want to admit having owned), in Stereo they all pretty much meet or exceed their published specs. The Sunfire Sigs FAR exceed those parameters. The early mag amps I owned were under-heat sinked for use in a mono configuration, and I still have written correspondence from Bud Coffman (ca. 1992 or so) saying that they didn't advise running those particular amps in mono with my Amazing Plat III's. But in vertically bi-amped Stereo, they were brutal and comparatively bulletproof. IMO, the only people that run these amps down are the people who've never owned them. YMMV. Wow...that all just sounds like...like...fun! Good music in many ways just brings so much fun. That is about what I start visualizing when I think of that kind of power.